Did this in haste due to a plague of mozzies and the danger of losing the moon behind the neighbor's tree. 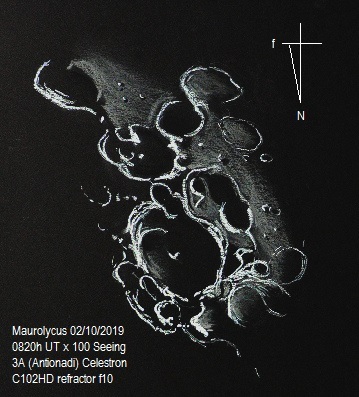 The area around Maurolycus is so pockmarked with craters that I was is severe danger of adding too many....Mare area to the east is so dotted with numerous small craters, I was reduced to just sketching the main ones! Fine looking capture of the highland around and including Maurolycus crater. bearing in mind that you've been in a hurry, this is really a fine sketch! Thanks for sharing with us! Now you know why I do not do lunar sketching, I do not know when to stop. So much detail to capture, so little time to capture it. I like the way you rendered yours. Very nice, especially considering your time constraints. Very nice This is the sketch that never ends... .